Tag: Shop Online Stampin’ Up! SNOWFLAKE SHOWCASE WEEK – DAY 1! This week I am featuring the Snowflake Showcase Suite. I have had so much fun creating with these products. They are absolutely gorgeous. All the details and the delicate little snowflakes. are so pretty even if we don’t have snow here at Christmas. You can create so much more with them though not just for Christmas. I will be showing these ideas too. So each day this week watch out for the projects in my Snowflake Showcase Week. Here is today’s projects. Well it’s actually 2 cards for you in different colours. This one is in Bermuda Bay. I actually made this one a few weeks ago and we used it as the make in my team meeting. You can’t tell but that gorgeous swirl is cut in the White Velvet Paper. So soft and furry. I do love it. The sentiment is stamped in Basic Gray. I find that a little softer sometimes than stamping in the black. The tiny snowflakes are stamped in Pool Party. This version below is in Night of Navy with the small snowflakes stamped in Balmy Blue. The sentiment on this one is stamped in the Memento Black. This is the lovely products in the suite if you haven’t seen them yet. IT’S DOWN TO THE LAST DAYS FOR SALE-A-BRATION! The time when you get free products whether you shop or join is running out. If you want any of these FREE products then grab them NOW! There are some beautiful and fun free choices. See all the Sale-A-Bration items -> HERE. Recently added is some select current catalogue products you see below that you can choose for your free items. HOW DO YOU GET THEM FOR FREE?? With orders over $90 (or $180) you choose one item for Free. That easy – really! AND this week it’s double loyalty points**. **If you recall my VIS loyalty card. For every $50 order you receive a little punch out on a card I keep. When you collect 10 you get free products up to $24.95. So this week you will get 2 punch outs for every $50 order meaning you will get more free products earlier. See further below how to order. BUT $240 OF FREE PRODUCTS WHEN YOU JOIN??? During Sale-A-Bration you will get extra free products when you join the Stampin’ Up! Family. It’s great being with this fun company and getting a discount every time you order. Not to mention all the other perks. ** Order $235 products -> Pay $169. Pay No Shipping. 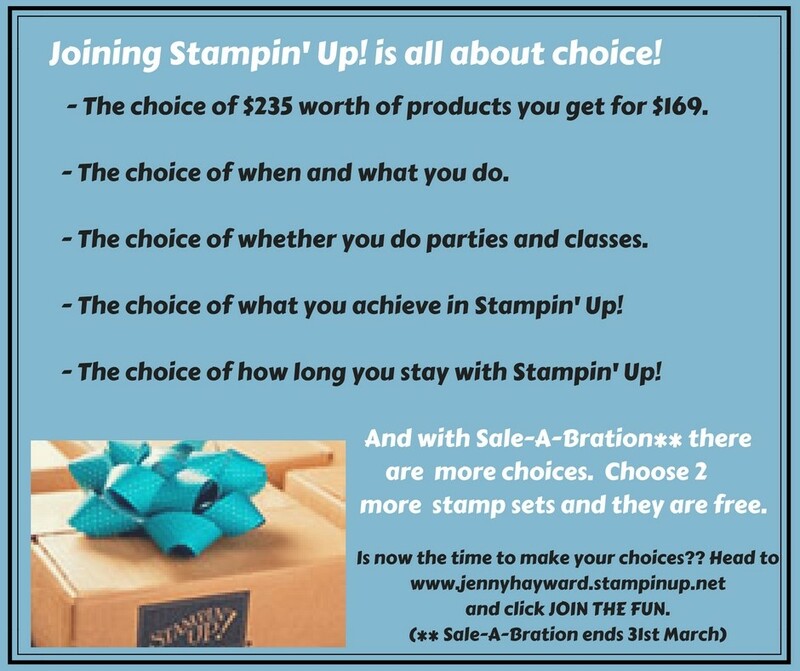 PLUS for Sale-A-Bration choose 2 extra stamp sets for Free up to $174. TOTAL FREE PRODUCTS = $240. Want to know more? Head to my Blog -> HERE to see 10 reasons Why you need to be part of the Stampin’ Up! family. Join -> HERE online straight away once you have your joining order together. Grab one (or more) of these Free Sale-A-Bration products? (and get double loyalty points). **ORDERS MUST BE IN BY 8PM SATURDAY 31st. Thanks in advance for your orders. SELECT CATALOGUE PRODUCTS NOW AVAILABLE AS SALE-A-BRATION CHOICES! 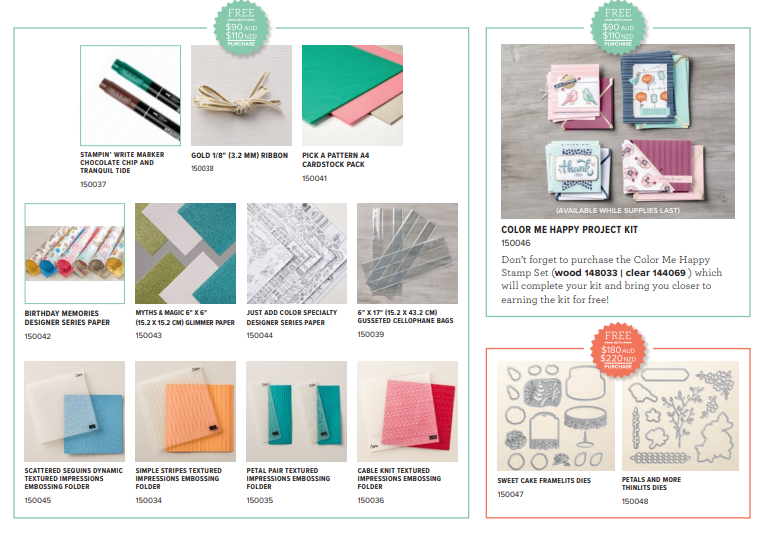 As if Sale-A-Bration isn’t exciting enough but Stampin’ Up! keep on giving! Just announced: Stampin’ Up! have released some new choices for Sale-A-Bration AND they are catalogue products. Check them out. As already for Sale-A-Bration there are 2 levels of products. Level 1 is for orders from $90 (green circle choices). Level 2 are orders from $180 (orange circle choices). I know the products aren’t too clear in this image but you can see them in the catalogue. So have you stocked up on your cardstock and ink? What about the reinkers for the retiring incolors? Throw in some adhesive and you are at least at $90 before you get to stamps and dies. As a bonus you choose something for Free! In Australia? Head to my store -> HERE now. Go shopping and then choose your Sale-A-Bration item. If you want to choose one of the above items you will need to use the item numbers on the image above. As they are a little hard to see, drop me a message or comment to ask me. You can contact me directly to place your order.